If you missed the post that introduces “the money side” of our off-grid transition, check it out! As Amanda and I discussed dozens of different life-transition options, looked at their costs, and wondered about how we would afford everything, we began to realize that a fully developed money management strategy was essential to our off-grid transition. I personally have always been over-organization-phobic. Why take the time to put a bunch of stuff into “relevant” categories, doll it up with graphs, and review trends and reports when it seems so simple: Spend as little as possible, at all times, and you’ll always come out on top. What’s so complicated about that? We have a whole bunch of ’em, and, to be honest, very few of them make reducing expenses easy or intuitive. Eating fresh, local, organic (careful to avoid greenwashed) food. If we want to live our values, our potentially $200/month food bill (if we shopped like most of America) could triple. Reduce the amount of packaged food we consume (less trash, fresher food). We’ve heard this is cheaper, too. How can we track exactly how much cheaper? Regularly support only (or mostly) the restaurants that share our values. How can we do this, and review our success month by month, without having to develop complex, manually managed spreadsheets? Enjoy ourselves. How do we know what we can reasonably afford, without having to resort to psychological games & justifications like “I’ll just get it this once,” or “I deserve this for all of my hard work!” or anything else the way-too-clever brain can come up with? Travel the world. How, without making the cash most globetrotters do? Support the organizations, projects, and businesses whose work we believe in. Creatively reduce expenses to their barest minimum, without sacrificing other goals. Open and manage a retirement account (or two), a few investment accounts (perhaps using Lending Club and Kiva, plus more traditional means), a green credit card (to automatically benefit green-minded businesses), compare the success of micro entrepreneurial ventures side-by-side, and review any existing debt (including loans). How can we see and manage the real-time impact of all current assets and debt, across several accounts without either spending hours per week hand-organizing this data or paying someone to do it? Reduce the amount of time needed to organize and interpret all of this information, to free focus for life crafting and joy. Make money management kind of exciting and fun (which is my unofficial creed for anything in life). I eventually discovered that–if we want to get serious about making our money management strategy help us build our lives for the next 50+ years, and maximize our impact on the things we care about–we need something more robust than a “spend as little as possible, in all situations” policy. An Overview page that shows all active accounts and auto-calculates net worth [cash (plus) hard assets (minus) debt]. This makes it impossible for credit card or loan debt to hide and make us think we have more than we actually do. In the lower-left, this page also provides a quick, interactive visual that shows our last six months of net income. This quickly points out months where we’ve earned or lost, allowing a quick zero in on successes or problems. The Budgets page. This allows us to define monthly income and spending goals. The defined income automatically determines how much is available for the spending budgets, and all numbers can be tweaked with hardly any effort. Considering that my income is often highly variable, this is extremely helpful. Also, as spending occurs throughout the month, a line connected to each budget fills up. This allows a quick visual snapshot of how well we’re sticking to dozens of budgets. 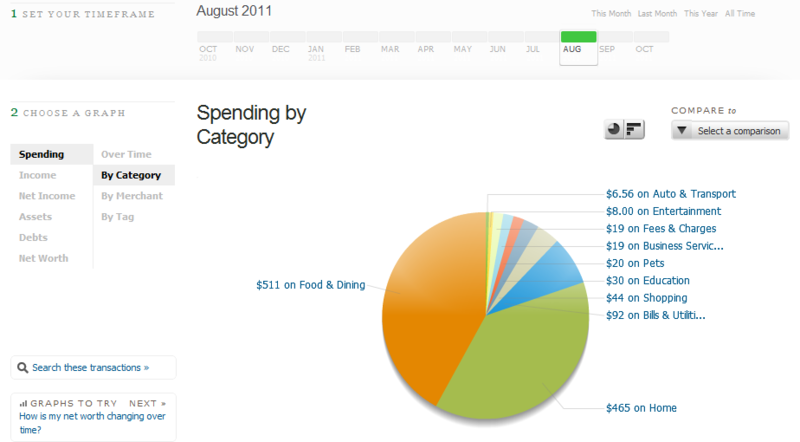 Mint's "Trends" page is a wonderful feature that makes managing spending easy. This pie chart is fully interactive. The Trends page, my favorite. I use this to see which months were considerably expensive (and determine why – to avoid repeats), which were the cheapest (to use as models for future spending), to make decisions on how our spending behavior needs to shift (if something is sucking away too much, we know we need to build a strategy to minimize it), and to access all details about where our money has actually gone. It’s possible to drill down to each transaction and make very fine-grained decisions on whether or not they should occur again. Mint also offers a “Goals” feature, which allows one to easily open a savings account per goal and deposit a small amount of money into it each month, to save for any number of goals. We might use this, though it will probably make more sense to micro-invest our money (as suggested above) with services like Lending Club or Kiva. The returns tend to be much greater. That’s where we’re heading. Money used to be a mystery. I know I wasn’t taught how to manage it effectively in school. It is especially challenging for people who dislike dealing with numbers. Mint lends both linear and visual components to our many management strategy, which pleases both sides of the brain. We really like it, and plan to grow ever more skilled at using it. If I discover anything else really mint-flavored, I’ll be sure to share! P.S. Any thoughts or tips on money management you’d like to reveal?